Refugee Women’s Alliance (ReWA) is an award-winning, nationally recognized nonprofit that provides holistic services to help refugee and immigrant women and families thrive. In 33 years of work with multi-cultural communities, we have refined our services to most effectively promote integration and self-sufficiency. All of our services are designed to quickly and effectively stabilize clients, promote acculturation, increase language proficiency, and improve employability. Our services are available in over 50 languages and dialects. This means clients are paired with professionals who speak their first language and are specifically attuned to their native cultures. Because of this, staff are able to address the unique barriers to success that each of our clients face. 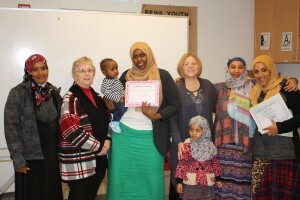 The local refugee and immigrant community sees ReWA as a home base, where they can overcome the barriers they face, connect with opportunities, and network with one another. Because community members feel safe and supported, ReWA has a positive and far-reaching reputation. Immigrant and refugee residents are familiar with our programs, and readily refer their friends, family and new arrivals in their communities. Our reputation goes a long way toward increasing program accessibility for local and newly arrived immigrant and refugee residents.